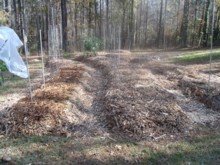 How to mulch - successfully block weeds while enriching the soil. On this page I would like to discuss how to mulch successfully using Ramial Wood Chips, or RCW. Ramial chipped wood is wood chips made from freshly cut small branches and twigs from hardwood trees. These are available, usually for free, from tree trimming companies. Ramial Chipped Wood (RCW) not only fulfills the functions of a mulch, but it also has the incredible ability to radically improve the soil. To learn more about ramial wood chips, please see the menu on the upper right of the page. After a year or two, ramial chipped wood satisfies many of the nutritional needs of the soil. It doesn't contain vital trace minerals, but concentrated ocean minerals can easily meet this need. 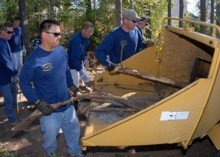 If you obtain your wood chips from a tree trimming service or utility company, chances are you can apply them as is. If you are doing the chipping yourself, chip the wood between 1/2” and 1” in length, and about ½” in width and thickness. If you are only chipping a small amount, you can use a hatchet or machete. For larger scale, larger chippers that are driven by the power take-off of a tractor can be used. My neighbor, who is expert in how to mulch with RCW, uses wood chips to mulch his acre and a half garden. Trucks use his place as a dumping site for wood chips, and many times they sit there for months before he spreads them. Because there is moisture in the stack of wood chips, a pile of RCW acts as a compost pile. The pile heats up and bacteria work to break them down. When composted, wood chips produce a rich soil, but can lose much of their useful energy in the process. When ramial wood chips are applied as a mulch, fungi break them down. This digestion by fungi can dramatically build the soil. 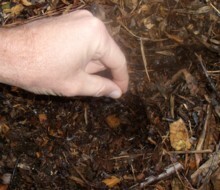 Therefore, it is best to spread the wood chips as a mulch shortly after they are chipped, instead of storing them. RCW does well when applied 3” to 4” thick. At this depth, the upper wood chips protect the bottom inch of chips from the sun and wind, helping it to retain its moisture. Fungi need a moist environment. If you only want an inch of RCW, then it is best to either work it into the top 2 inches of soil, or to water it frequently to provide a damp environment for fungi. A better method of how to mulch is to incorporate an inch of RCW into the top 2 inches of soil, and then apply another inch over top. More than 6” of wood chips can cut off air flow to the soil, having the undesirable effect of causing soil bacteria to go anaerobic. Before applying RCW, the soil needs to be moist. If the soil is dry, the 3 or 4 inches of RCW will soak in light to medium rains and moisture will not penetrate to the ground. Of course, if you are expecting a heavy rain, it is no problem to apply RCW over dry ground. To break down wood chips, fungus and bacteria need oxygen. In waterlogged soils, water fills in the air gaps in the soil, and fungus and bacteria suffocate. If you are planting a garden in an area that where water doesn’t drain well, use raised beds to help the soil to drain. Good news! When you know how to mulch, broad leaf weeds will rarely penetrate 3 to 4 inches of RCW. To stop grass from growing through your RCW, put down 3 or 4 layers of newspaper and wet it before applying your RCW. To stop grass from spreading into your garden from surrounding lawn, you may bury a physical barrier, or simply rototill around the parameter of the garden each year. One of the greatest weed problems I had with weeds between my raised beds and pathways. After I applied 4 inches of RCW to my raised bed garden, it dawned on me – why not put down RCW in the pathways between the raised beds over my weed guard. So I did. Now RCW covers this area as well, stopping weeds before they start. What a great how to mulch idea. For transplants or for plants spaced 6 inches or more apart, I simply pull back the RCW down to the soil level, and plant in the soil. For more closely spaced plants like radishes or carrots, RCW may be pulled back to form long rows to plant in. Once plants come up a few inches, the wood chips can be moved in closer to the base of the plant to discourage weeds and to seal in soil moisture. Once your wood chips have been in place for a year or more, you will have a dark, rich wood chip compost just below the wood chips that you can plant in. More "How to Mulch with RCW" info. For the technical minded who would like proof of the benefits of RCW, you can go to this website to view the results of scientific experiments using Ramial Chipped Wood to mulch various crops. For years now I have given my lawn and garden a boost by applying liquid humic acid, mixed with ocean trace minerals. These humic acids jump start the soil building process by gluing together fine soil particles, building a crumbly friable soil structure. The ocean trace minerals supply an incredible buffet of micronutrients which long ago have leached out of our soils. Next page - Composting Wood Chips!